Photos only. Showing you how the wine looks like after you have sieved out from the rice residue. the wine should be milky, not clear. leave it in a clear bottle so that you can see the contents. Leave it aside for 2 days at least. Away from direct heat(stove or window). It will start to separate again. I have already poured out most of the wine..leaving a bit here. Pour it slowly into another bottle. 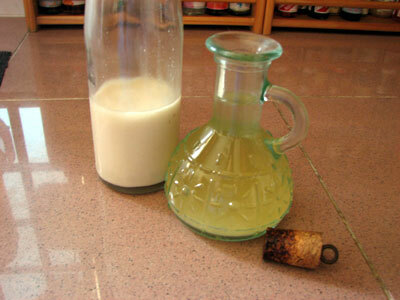 What is left is a bottle of murky wine that has yeast in it. The smaller bottle is the clear rice wine. That is use for cooking. 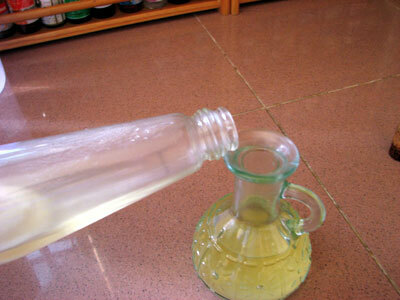 Home made rice wine are slightly yellow in colour..not like colourless water. It should taste a bit sour at first and have a strong sweet taste that lingers in your mouth. For those who never tasted home made wine, this is how it tastes like. The commercial ones we get are often sour than sweet. As to how long you can store this. If you leave it outside the fridge, the flavour enhances over time. It becomes stronger and more alcoholic. If you leave it in the fridge, it stays the same. I've just started making some rice wine after i got all excited from seeing all your photos!! let's hope i'll be successful! from the picture, i see that you have quite a bit of murky wine with yeast in it. What do we do with this? Can we use it for cooking like the rice residue or do we throw it away? 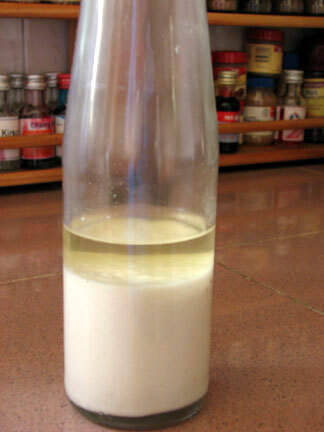 The murky wine residue is used to ferment the subsequent batch of rice wine. You may have heard of people telling you that they add wine to the fermentation period. This is the best wine to use for this purpose. If not, you have to buy a good and expensive bottle of Bai mi jiu for this process. If you don't use it this way, you can use it to marinate seafood or red meat and use it for cooking. Makes the food more flavourful. and lastly, if don't want to use at all, GIVE ME! I have started to make the rice wine last saturday. I realise i forget to put in sugar and only manage to put in at the very top layer. till now the yield seems patetic comparing to your yield. Should i add more sugar? The top still look very solid but there is liquid at the bottom already. Should i stir?